Got a need to view Microsoft Outlook Express 4, 5, or 6 e-mail without having access to Outlook Express? 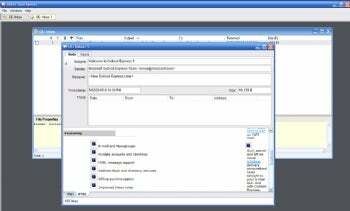 Want to view Windows Vista Mail and Windows Live mail message databases? You'll want MiTeC Mail Viewer. This free program lets you view those message stores, as well as message stores in any standalone .EML files, used by some e-mail programs. Simply run MiTeC Mail Viewer, point it at the location of the file, and then select the folder you want to view. You'll then be able to browse through the e-mail, and save individual files as well as attachments. It's also nice that you can view not just the e-mail itself, but also the source code as well. This can come in handy for tracing suspicious e-mail or checking for phishing scams. The program does have some problems, though. It didn't properly read HTML messages; I could decipher the content, but it didn't look like the original message. Aside from that, MiTeC Mail Viewer is free and simple, so worth a try if you need to view Outlook Express e-mail without having access to Outlook Express.